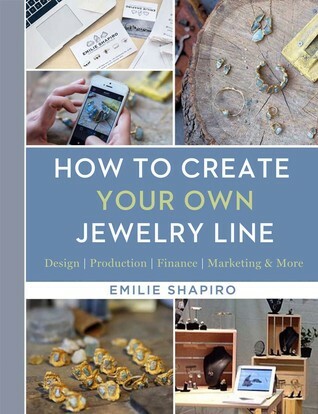 If you’re a jewelry designer and are looking to make a first entry into establishing your own business, check out designer Emilie Shapiro’s How to Create Your Own Jewelry Line (Get your copy here >> B&N, Amazon, IndieBound). And guess what!? You can enter to win one of seven copies in our Goodreads giveaway right now! Giveaway ends November 11, 2016. I have found the majority of people in the jewelry industry—and most industries—to be very secretive when it comes to sharing trade insights, contacts, best practices, and trials and errors of their own path. After getting loads of questions about this from my students, I decided to teach a lecture-style class about jewelry production. The response was overwhelming. Through years of experience holding many different jobs in diverse facets of the jewelry industry, I have learned from my mistakes and accomplishments and have applied all those lessons to building my own company. In writing this book, my goal is to share the insights I have gained with aspiring designers to help them become successful jewelry designers and business owners. I am extremely proud to be writing this book, and to make this information available to a large audience. I have always had a knack for design and business, but it took me many years to develop the skills and the patience of a craftsperson. From my earliest days, I was interested in designing and creating things. My father worked in sales at a fabric mill in New York City’s garment district, so fabric samples in all sorts of patterns were always available in my playroom. I have fond memories of wandering the sample floor high above Eighth Avenue and learning about color and texture. When I was five, I loved designing and making clothes for my dolls. Using my (not-so) safety scissors, I would cut up my fabric to make outfits for my dolls. I made my first piece of jewelry when I was thirteen and haven’t stopped since then. After my grandmother passed away, I found a bag of her costume jewelry. I was always fascinated by how things were made, so I started taking apart my grandmother’s necklaces, bracelets, and brooches and putting them back together in a new way. Focusing on design, rather than construction, I haphazardly assembled my own pieces, but they always fell apart. When I was in high school, I started selling my jewelry to friends, family, and the people who would watch me make it while I was working at a local beach club. My designs were strong, but the craftsmanship was weak. Running a jewelry production business is different from being an artist. An artist can focus solely on design and aesthetics. A jewelry entrepreneur must be concerned about the customer’s satisfaction after the purchase. You’re looking to create a piece that will be cherished and passed down from generation to generation. I didn’t learn this until many years later, but it takes time to hone your craft. It calls for a lifetime of research, discipline, trial and error, and learning from your mistakes. Certain things come naturally to each of us, and certain things have to be learned. Design and business were always strong suits for me. I knew two things: I wanted to be my own boss and I wanted to make original pieces that would be treasured for years to come. It looked fascinating and I chose to investigate each substance and I read yours. My compliment about this blog is exceptionally positive I visit this blog first time and inspire by this good stuff work. Incredible post keeps up posting such great information. we need lifelong research, discipline, trial and error, and learn from mistakes.